This one runs about ten minutes…. Ride a spy plane. See the world at 30,000, 40,000, 50,000, 60,000 and finally at 70,000 feet. From 70,000 feet you look down 35,000 feet at a jetliner passing below at its normal cruising altitude of 35,000 ft. Turn up your sound and expand your picture. Only the International Space Station is higher. 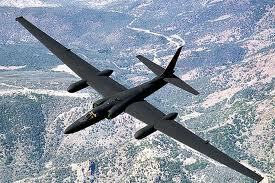 This video is a once in a lifetime experience of a British civilian getting a flight at over 70,000 ft. in a U-2 spy plane. Note at the take-off the assist wheels on the outer edges of the wings which drop off upon take-off. The wings are so long that they need temporary support until lift-off. What is not shown is at the landing the plane actually slows to a small enough speed that two guys are actually able to grab the wing tips and put those assist wheels back on. Use your full screen and sound as this is a high-quality film clip. My Comment: It’s amazing to me that, after a ride like that, a man can make a statement like the second to the last sentence uttered in the video. This entry was posted on Saturday, June 15th, 2013 at 8:22 PM and is filed under Creation, LIFE, Science. You can follow any responses to this entry through the RSS 2.0 feed. You can leave a response, or trackback from your own site. Very nice! I occasionally visit wimp.com as they have an app for the Iphone… Interesting videos there…. I didn’t know that. I’m not real good with cell phones, but I’m using an Iphone 3 from work and I’m still getting to know the thing. Hope you have a great Father’s Day.